Mandarin Essential Oil can be used to aid the discomfort of abdominal distension (swelling) and can also be used to aid with digestion, the release of phlegm and memory recall. While the use of mandarin essential oil for medicinal purposes is minimal, it is also widely used in baking and cooking as a flavouring or coloring agent. Also, mandarin oil can be used in combination with rotenone as an effective combatant of citrus red mite. Mandarin essential oil is derived from the mandarin orange, which comes from a small citrus tree and is said to have its origins in Southeast Asia. It is thought that the mandarin orange was cultivated in China as far back as 3000 years ago and arrived in Europe in more recent times – sometime during the 19th century . Despite the global spread of mandarin cultivation, China remains the number one producer of mandarins . 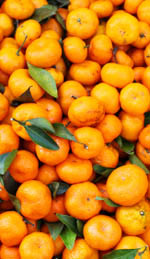 Mandarin oranges arrived in Canada and the United States of America sometime shortly after their arrival in Europe; however, in the United States the oranges are referred to as “tangerines” . But, it is worth noting that while many people use the terms “tangerine” and “mandarin” interchangeably, each term actually refers to different varietals; the tangerine is actually, most properly, a varietal of the mandarin orange . Mandarin oranges and tangerines have a fairly widespread cultural significance as well. They are used during the Chinese New Year to symbolize abundance and good fortune; they are displayed as decoration and given as gifts. And in Christmas-celebrating nations, such as Canada, the U.S.A and Russia, the oranges are a traditional fruit given in stockings . While most essential oils are extracted through a method of distillation, citrus peel oils (including mandarin) are generally extracted using a cold-press method similar to how olive oil is extracted from olives. Citrus oils tend to be amongst the cheaper essential oils, given the high volume of oil that the peels yield, relative to the amount of fruit used . Mandarin oil is primarily used as a scenting and flavouring agent. Given its aromatic quality, the sweet citrus scent is highly sought after for scenting household cleaning products, beauty products, candles and other items. Given the sweet tastiness of mandarin orange, the oil is also used as a flavouring agent in many foods and baked goods, and it can also be used as a coloring agent. According to Mathew Attokaran, only the oil from the peel of the mandarin orange can be used as a flavouring agent or to enhance the scent of mandarin . Although the medicinal uses of mandarin essential oil are less notable, or at least not as well known as its flavoring and scenting properties, it does carry a few beneficial medicinal properties. Mandarin oil can be used to clear phlegm, to aid in digestion or to help with abdominal swelling and bloating . Furthermore, mandarin oil is part of the citrus family of essential oils, which in turn is part of the monoterpene functional group. This group of essential oils carries a particular set of medicinal qualities attributed to the oil constituents characteristic of this group: myrcene, limonene, and caryophyllene – with limonene being the primary constituent of mandarin essential oil . Limonene has been proven to prevent the increase of colon cancer cells and there is also some indication that it may be an anti-obesity agent . Another more obscure and less documented use of mandarin essential oil is memory enhancement. While the information on this particular quality of mandarin oil is limited, there is indication that it has been used to enhance memory recall in Alzheimer’s patients [2, 105]. In terms of aromatherapy use, mandarin essential oil can be blended with numerous other wonderful oils to have an increased synergistic effect or to add to its qualities. Some essential oils that mandarin oil blends with particularly well are basil, coriander, chamomile, sage, geranium, grapefruit, lavender, neroli, palmarosa, petitgrain, rose, and other citrus oils . But, given the very versatile and benign nature of mandarin essential oil, you can really have a lot of fun with it in terms of blending with other sensually pleasing oils and come up with your own concoctions! Aside from aromatherapy blending, mandarin oil can also be combined with rotenone (a toxic substance obtained from derris roots and other plants in the same family) to create a synergistically effective pesticide. When mandarin oil is combined with rotenone, the blend acts as an effective pesticide against citrus red mite and could offer an alternative to the use of synthetic chemical pest solutions . While mandarin oil is a relatively benign essential oil, there are nonetheless a few mild safety concerns that are worth taking note of. The oil may cause a phototoxic reaction in the skin to which it has been applied if exposed to the sun for an extended period of time. However, there is no substantial indication that the harm goes beyond a mild skin irritation . Furthermore, there is a bit of academic backing to suggest that if mandarin essential oil is directly applied to your skin for an extended period of time – exposed to sun or not – skin irritation may occur [2, p. 85]. As a result, it would be wise not to use mandarin essential oil directly on your skin, and especially wise to not use it on your skin and then expose yourself to direct sunlight. Overall, mandarin essential oil is a wonderful oil to make use of for all kinds of purposes. And given the benign nature of mandarin oil it is a good essential oil to get started with if you’re fairly new to the aromatic world. It has such a lovely scent that can be enjoyed alone or paired with another beautifully smelling oil! 1. Attokaran, Mathew. Natural Food Flavors and Colorants. Blackwell Publishing LTD, February 7, 2011. 2. Buckle, Jane RN, PhD. Clinical Aromatherapy – Second Edition. Elsevier Ltd, 2003. 3. Gao, Zeng, Cai-Yun Shu. “Solubility, stability, and synergistic acaricidal activity of rotenone in mandarin oil”. International Journal of Acarology. June 2009: Vol. 35(2), p. 169-173. 4. R.A. Ford. “Mandarin Oil Expressed”. Elsevier Ltd, 1992: Food and Chemical Toxicology Vol. 30(1), p. 69-70. 6. Sawamura, Masayoshi. “Citrus Essential Oils: Flavor and Fragrance – Chap. 7: Aromatherapy”. John Wiley and Sons, INC, October 14, 2010: p. 297-341. 7. Siddiq, Muhammad. “Tropical and Subtropical Fruits: Postharvest, Physiology, Processing and Packaging – Chapter 22: Tangerine, Mandarin and Clementine”. John Wiley and Sons, INC, 2012: p. 419-434. This entry was posted in Essential Oils and tagged aromatherapy, Essential Oils, liver support on November 13, 2009 by Keith Cleversley.